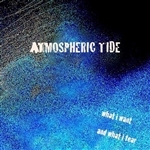 Atmospheric Tide (formally known as At A Distance) is an urban electronic musical project started in Pennsylvania in November of 2010. Our music is unique, our style reflects on many genres. The music is a unique experience and we hope the listeners enjoy. We credit Quiet Asylum for part in helping us with our album. UPDATE: "What I Want and What I Fear” is almost complete!! !